In Virginia, one voting machine was incorrectly configured to display Obama as a Republican and Romney as a Democrat. Once the error was noticed, officials switched to paper ballots to avoid future problems, and assured voters that all previous votes “would be counted correctly”. Of course, how that would be done is a different issue – it was impossible to tell if a vote for “Obama, Republican” was intended for Obama or for the Republican party. In the wake of hurricane Sandy, New Jersey announced that stranded voters would be able to cast their ballots online, via email. The process would involve completing a ballot, filling it out and scanning it it, then submitting it as an email attachment. There are more security risks here than you can shake a stick at. Email is not encrypted, making it open to interception and tampering en route – security issues which risk both voter privacy and election integrity. 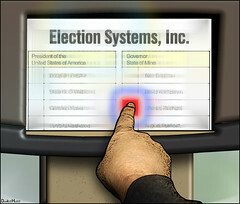 Secondly, computers were made available in many public places for users to email their votes – but this too makes them open to interference and tampering from unscrupulous users. Thirdly, the votes were sent as email attachments, requiring the receiving computers to open attachments from unknown users. Sending infected attachments has been a favourite infection method of malware writers for many years. Finally, sending ballots by email is not only slow and cumbersome, but violates the fundamental principle of the secret ballot – each vote is attached to an email address, and even if the address itself does not reveal the user’s identity explicitly, IP addresses are also recorded in email headers.